When many of us were in school, it seemed like only a small percentage of our peers received free or reduced-price lunches. Today is a different story. The U. S. Department of Agriculture estimates that 21 million children receive free or reduced-cost school lunches (12 million in elementary school). Of these, more than 16 million children come from households that don’t have a steady food supply. When you consider only 75.5 million children and adults are enrolled in school, the percentage must be nearing 30 percent. Blessings In A Backpack makes a difference. For a growing number of students, Blessings In A Backpack is helping to reverse the trend. The charitable organization is partnering with individual and corporate volunteers to ensure impoverished elementary school children are fed on the weekends. Every Thursday at each participating school, volunteers pack backpacks with ready-to-eat foods such as crackers, juice boxes, cereal, granola bars, peanut butter, tuna and macaroni and cheese. There is no cost. The backpacks are provided free of charge by the national organization. Students take the backpacks home on Friday, which gives them something to eat over the weekend. A nutritionist reviews the standard food items to ensure everything is nutritious, easy to make, non-perishable, and appealing to kids. For many, this may be the only food they have until they return to school. To date, Blessings In A Backpack has fed 59,000 children in 390 schools in 35 states as well as students in Canada, Colombia, and Haiti. It makes a difference, not only in the students' personal lives. but also in their academic performance. Specifically, students participating in the program show improvement in school attendance, test scores, and behavior. Their health and hygiene also improve. Here is one example of a success story. Rose and his wife Kate have supported Blessings In A Backpack since 2009, and their efforts have helped to feed more than 1,000 children in the Orlando area. The Roses have donated money and their time, and have also funded special events for children in their area. Other individuals and organizations that are stepping up to the plate. They are not the only individuals who are participating in the program. Actress/singer Hilary Duff supports schools in Los Angeles. 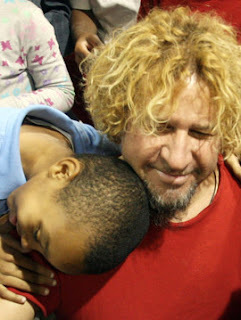 Singer Sammy Hagar (photo above) supports schools in St. Louis, Hawaii, Las Vegas, and New York. Celebrity chef Paula Deen supports schools in Indiana and Georgia. NBA player Dwight Howard supports schools in Orlando. And race car driver Dale Earnhardt Jr. supports schools in North Carolina. Along with their support, corporate sponsors have stepped up to help too. Walmart, Danskin, Dooney & Bourke, Meijer, and Farmer’s Insurance Group all provide support to the organization. The list is growing. Individuals are encouraged to get involved too. Blessings In A Backpack gives anyone the choice of partnering with a local school in their area to pack the backpacks or to donate to a specific area or school. A donation of $80 goes a long way. It buys a school year's worth of food for one child (38 weeks). The organization is able to stretch this budget thanks in part to a special arrangement with national grocery chains to provide non-perishable food items that will feed a child over the weekend for just $2.10 per week. Blessings In A Backpack Is A Liquid Hip Good Will Pick. At least once a month, Liquid Hip highlights good will efforts undertaken by people with big hearts. We don’t score them. That belongs to you. What makes this organization especially appealing is that 100 percent of all donations pay for food for the backpacks, directly benefiting the children. All of the organization’s administrative costs are funded by a private foundation. If you want to get involved in a big way, you can adopt a school that doesn't already have a program. Doing so requires a 3-year commitment, but Blessings in A Backpack provides a wealth of resources. The charity recommend speaking with student counselors in the area to help determine where the need is greatest.